The Royal London Hospital is a large teaching hospital in Whitechapel. It is part of Barts Health NHS Trust. 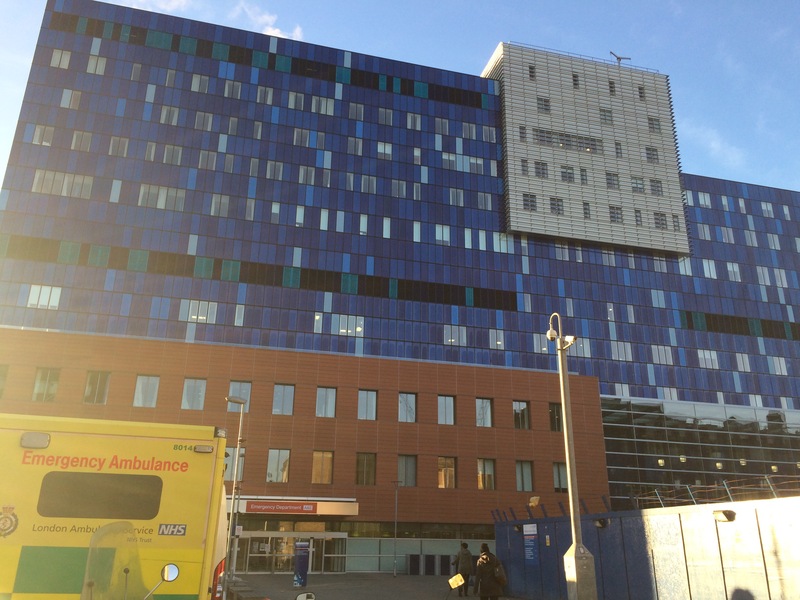 The Royal London provides district general hospital services for the City and Tower Hamlets and specialist tertiary care services for patients from across London and elsewhere. There are 675 beds in the new building which opened in February 2012. It has a helipad! The latest CQC report rated it as “requires improvement” across all domains, an improvement on the previous “inadequate“. Adequate Bronchoscopy experience including endobronchial biopsy. EBUS is available in the hospital (RLH). It is mainly done by Consultants but there are some learning opportunities for trainees. There have been issues with supervision of Bronchoscopy lists in the past, which caused problems when less senior trainees went to these posts. This is being addressed. It is still not felt to be appropriate for ST3-4s or those will limited Bronch experience. Since starting EBUS, the number of Bronchoscopies has reduced, which has affected trainee logbook numbers. In a typical week the SpR will do 1 TB and 1 General Resp clinic. On the odd occasion when there are 3 SpRs around, the clinic SpR would do 1 difficult asthma, 1 TB and 1 sleep and vent clinic. A typical week consists of 1-2 clinics, 1 bronchoscopy list, and 3 consultant ward rounds. The remaining time is spent on ward work and referrals. Unfortunately there is no dedicated administration time. The job is very busy, often necessitating early starts and late finishes. But there is plenty of pathology, and a very supportive consultant body. You mainly rotate between inpatient Resp (2 wards shared with cardiology and infection/immunity teams, no dedicated beds and so numbers can fluctuate significantly between 20 and at its worse 40 patients), outliers and referrals SpR (including all new Resp patients) and GIM. The outlier SpR will attend 2 clinics each week, the ward SpR will attended two Bronch lists per week. A bedside ultrasound machine can be borrowed from A+E. No dedicated departmental machine at present. There is no Level 2 accredited Consultant so sign-off is not a realistic prospect at present. There are Radiology SpRs but they are hard to pin down for sufficient time. Dr Barmania is Level 2 but works in acute medicine, not Respiratory. Each specialty has acute take slots which are then allocated within the specialty. This has led to some SpRs doing significant amounts of GIM when there have been gaps here. You tend to do 4-5 of these over 4-6 weeks before having a period back on the wards. Unfortunately there are regular rota gaps which make it challenging. A Consultant is onsite for most of the day take so post-taking occurs in good time. There are a good number of juniors at night although not many clerking during the day. Each day there is a take triage meeting where all acute admissions are allocated according to specialty and so naturally respiratory receives a significant proportion. The main problem is finding time to attend specialist clinics/meetings. HIV and TB are managed by specialist teams, and a special effort and the use of study leave is needed to get experience. The unit has a good mix of anaesthetic and medical Consultants which leads to interesting discussions and a wide breadth of skills. Some have particular research interests in areas from fluid management, assessment of brain activity after head injury, post-ICU follow up and ventilator-weaning. Caring for critically ill, often young, patients on an intense rota for six months can take its’ toll so prepare for this and look after yourself. The Consultants are very approachable and supportive so if you’re struggling with the work, the emotional demands or the culture shock make sure you talk to someone. There is a a real sense of teamwork, support and camaraderie which shouldn’t be undervalued. Lots of opportunities to learn! Very high quality teaching. Adequate experience in Bronchoscopy – on ventilated patients, which has its own challenges! Opportunity to take initiative/volunteer skills if trainees feel confident/competent. Interesting pathology in critically ill patients. Variable dependant on which part of the rota you are on. You do the non-airway ICU/HDU rota (so there will always be someone on the unit who can intubate), just the same as the ACCS/anaesthetic trainees. It is as brutal as any ICU rota with lots of weekends, nights and unsociable hours. But you get compensatory days off which can be very useful for writing research grants, revising for the SCE, or even non-work! There are C days 8-8pm (when you lead the team and are the point of contact for the Consultant), L days 2-10pm (when you often do procedures and admit new patients) and S days 8-5pm. The unit is split into HDU and ICU, and each of these is split into two halves. There are then teams which cover each of these sections, with a named Consultant doing the twice daily ward round and an allocation to staff to ensure an optimal still set. A typical day starts at 8am with handover. Each team goes through every patient at a board round, with particular attention paid to those who are most unstable, planned investigations and procedures, and infection risks. Every patient is seen by a trainee (you might review 4 patients), who then present their patients on the ward round. Jobs are allocated as you go round or in a quick debrief post ward round and the most urgent are completed before lunch (might not happen until 2pm when the afternoon shift starts). In the afternoon there are often patients to admit or review post-op, people to prepare for scans or procedures, new lines to do, and lots of liaising with specialties, as well as regularly reviewing the most unwell patients. Consultants do a further rapid ward round before the evening handover at 8pm. Chest drains: 5 – 10 (since most chest drains are ‘surgical’, inserted in the context of a trauma call). The unit has a dedicated bedside ultrasound machine with a curvilinear probe, in addition to other machines with flat probes used for vascular access. There is no Level 2 trained Consultant in the department, but you can get a Radiologist to come up to observe. If you are already Level 1 competent your skills will be put to good use. This is not an ideal job in which to try to get signed off. NA – on calls are in ICU, not on the acute take. Obviously lots of GIM experience in critically ill patients. There is plenty of formal and informal teaching in this job. No obvious opportunities, but perhaps not your priority in this rotation. Of course there is always the opportunity for a quality improvement project (which would count as GIM).